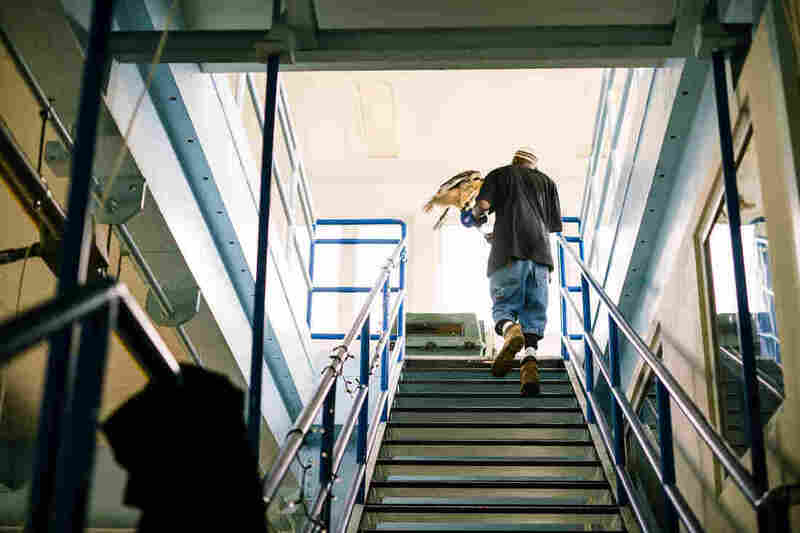 Rodney Stotts walks across the roof of the Matthew Henson Earth Conservation Center with one of his hawks. 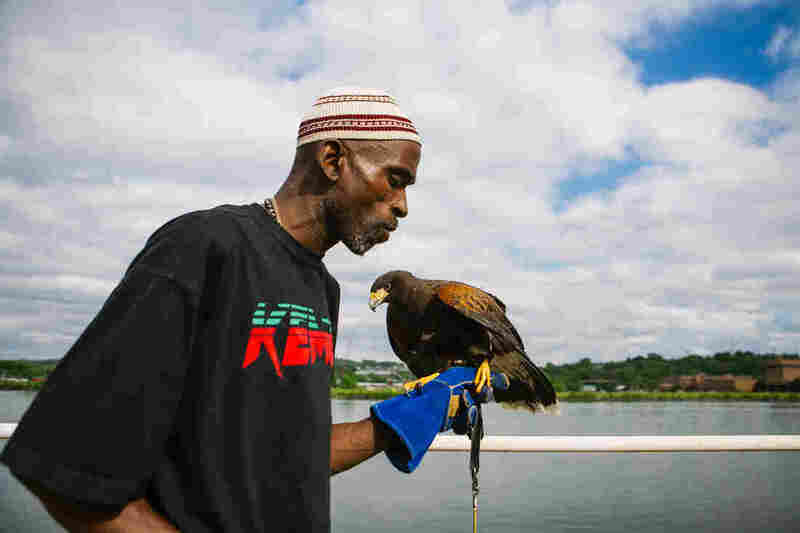 A former drug dealer, he is now a falconer — one of only 30 African-American falconers in the U.S., he says. On an overcast late-spring afternoon, a group of bird lovers from the Earth Conservation Corps are in a boat on Washington, D.C.'s Anacostia River, and point out an osprey circling overhead. "This is like their summer vacation spot and where they have their young," says Bob Nixon, in the boat. "Then they spend most of their lives in the Amazon." It wasn't so long ago that the ospreys – and other large birds of prey known as raptors – avoided this place. The Anacostia, often called Washington's forgotten river, was too polluted to support wildlife. Nearly nine miles long, the river flows from Maryland into the Potomac, but became infamous in the second half of the 20th century as one of the most neglected, trash-choked waterways in the United States – a blighted river amid blighted neighborhoods. 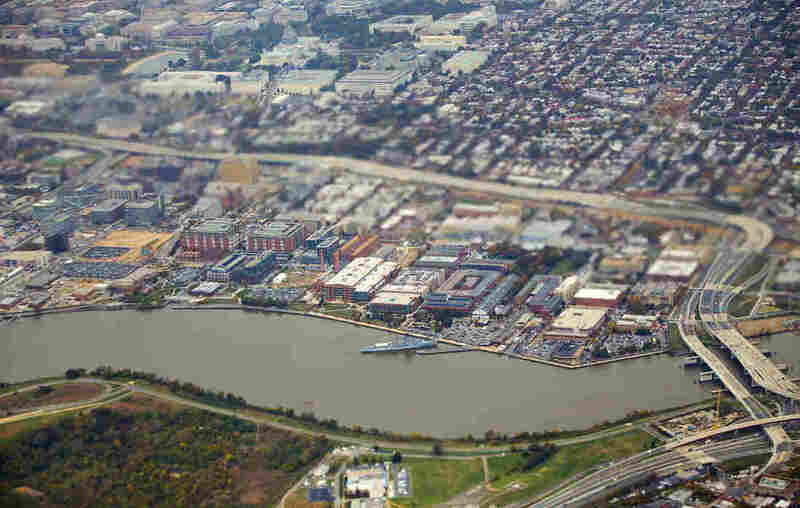 But in recent years, the Anacostia has seen a rebirth. 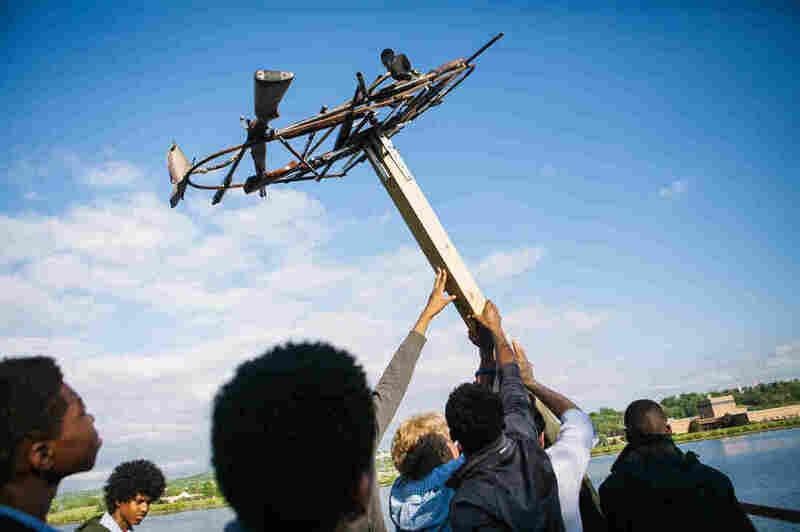 Thanks to the efforts of the Earth Conservation Corps — which Nixon, a filmmaker and conservationist, started 25 years ago — there are now four osprey nests on the river's Frederick Douglass Memorial Bridge. "We've turned this into a raptor hotel," says Nixon. There's shad and bullhead catfish in the river for the ospreys to hunt. And from time to time, a bald eagle may even swoop in. "What the eagles do, they watch the osprey hunt and once the osprey catch a fish, the eagles take it from them," says ECC staffer Twan Woods. The eagles' presence is due to the corps' efforts as well: The group helped reintroduce the bird to Washington after decades of absence. It all started with a long-ago promise Nixon made to Dian Fossey, the American primatologist who worked to protect endangered mountain gorillas and was murdered in Rwanda in 1985. Fossey had offered Nixon the rights to her life story in exchange for a year of his life – he had to devote it to a conservation project. After Fossey's death, Nixon, who'd already made a documentary about her, co-produced the 1988 Oscar-nominated film Gorillas in the Mist, starring Sigourney Weaver. "When we finished that movie," he recalls, "I kept thinking I should pay Dian that debt." At home in Malibu, a New York Times story about a polluted Anacostia tributary caught Nixon's eye. "That sounds good!" he thought. And in 1992, he flew to Washington to get started on what he thought would be a year of work. "Those were some serious times, rough times," recalls Burrell Duncan, who was among the first volunteers Nixon recruited from Southeast D.C.'s Valley Green housing project. The choices facing kids in Valley Green in the early 1990s were stark. "You could be three things," Duncan says — "a drug dealer, a killer or you could play sports." When Nixon, who grew up on Philadelphia's Main Line, landed in D.C. seeking volunteers to haul garbage out of the water, "I thought it was a joke someone was playing on us," Duncan says. "What is this Caucasian doing? Don't he know where he is?" He worried that Nixon might be killed. "He drove a blue Jetta," he says. "He stuck out like a sore thumb." Rodney Stotts, then 22, was another of the early volunteers. "I was a drug dealer," he says. "Typical D.C. youth, drug dealing, everything that went along with it, hustling." He didn't sign on for the money — he was already making plenty. 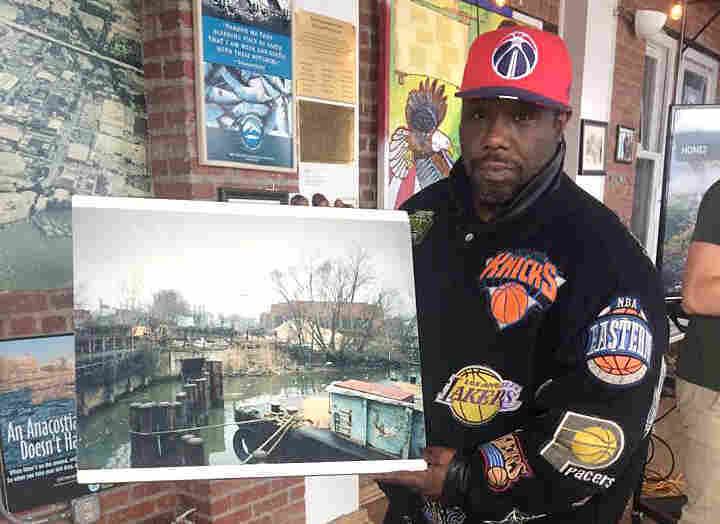 "When I was selling an eight-ball of cocaine, it would cost you $125" – more than the $100 he'd make in an entire week slogging through the trash and muck of the Lower Beaverdam Creek, the Anacostia tributary Nixon wanted to clean up. But Stotts joined because he needed a check stub to rent an apartment. In the first three months, a team of seven young men and two women waded into the creek and dragged out everything from car engines to sofas, bikes — and 5,000 tires. "They cleaned every scrap out of that creek," Nixon says. It was hard work with no prestige, and their friends in Valley Green gave them a hard time. But "we started feeling a sense of accomplishment and pride," says Anthony Satterthwaite, another of the original volunteers. That sense of accomplishment was key. One thing Nixon quickly realized was that the polluted waterway was only part of the picture. The obstacles his team faced in their daily lives were formidable. "I'm America's nightmare," one of them told Nixon. "No one ever thinks anything good could come out of a place like this." In those early days, it wasn't unusual for the volunteers to arrive to work armed, Duncan says. "It was guns on the river, and it was attitudes," he says. "People were uncomfortable with the fact of being in a creek. You don't know what you're gonna run into – who you're gonna run into." Few of them had known each other before starting with the Earth Conservation Corps, but little by little, their sense of camaraderie grew along with their sense of achievement. Meanwhile, the outside world wasn't changing: "You could come to a safe haven and be as positive as you want," Satterthwaite says. "But we still gotta go home." Violence and tragedy intruded. Monique Johnson, one of the first corps members, was murdered four months after they started cleaning up the creek. Other lives were cut short. Of the first nine volunteers, only four survive today. "We buried 26 corps members in 25 years," Nixon says. One was beaten to death "because he sat on a bench someone didn't want him to be sitting on." Others succumbed to illness. All, Nixon says, died in one way or another due to the circumstances of extreme poverty. He and the surviving and new corps members kept working. They wanted to keep making a difference and make sure their friends would not be forgotten. 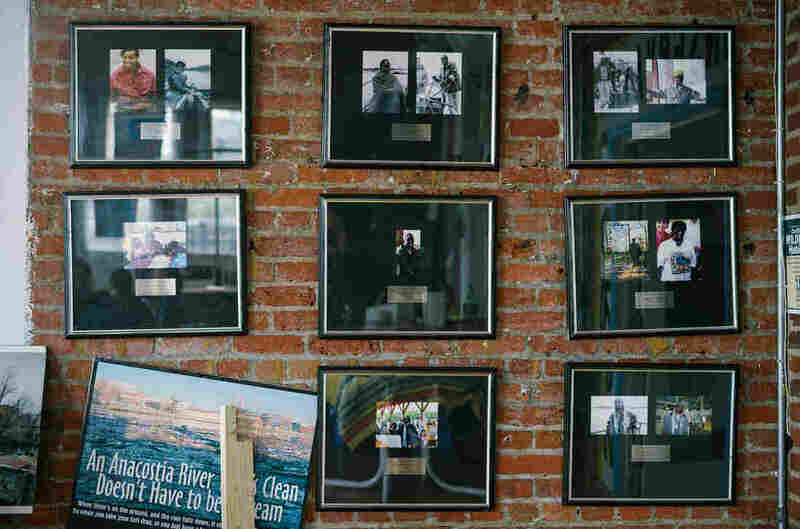 In 1994, two years into the Earth Conservation Corps' work, Washington was in the midst of a crack epidemic, with a murder rate topping 400 a year. At that low point in the city's recent history, Nixon had the idea to bring the bald eagle back to the nation's capital. It had disappeared decades earlier. Between 1994 and 1998, members of the corps raised and released 16 bald eagles. Anthony Satterthwaite and Burrell Duncan fed the very first eaglets – hatched in Wisconsin and delivered to Washington to start the reintroduction program – by hiding in the woods and sending fish via a clothesline pulley system into the boxes where the baby birds were kept high up in a poplar tree. They couldn't let the young birds see them, for fear that they'd imprint on humans. When the birds were old enough, the boxes were opened. "To see these birds fly away from this box they were in for three months – just joy, man," says Satterthwaite. "Just joy." They named the eagles in memory of their fallen friends — Monique Johnson and the other corps members they'd lost over the years. "We wasn't supposed to live to see the age of 21," says Satterthwaite. "We was just as endangered as this majestic bird. So it became very powerful and we connected the two, and that's why we started our raptor education program with Rodney Stotts." This year, there are three eagle's nests in Washington. A naming contest was held for one of the eaglets, which hatched March 15 in southwest Washington. The winning name: Spirit. Its parents are Liberty and Justice. "We no longer have to name them after dead colleagues," says Nixon. "Me and Rodney had a confrontation back in the day," says D.C. police officer James Thomas, better known as "Hammer." "That's how we became friends. He's dealing drugs and I'm the police... put that together. We had an impact on each other." 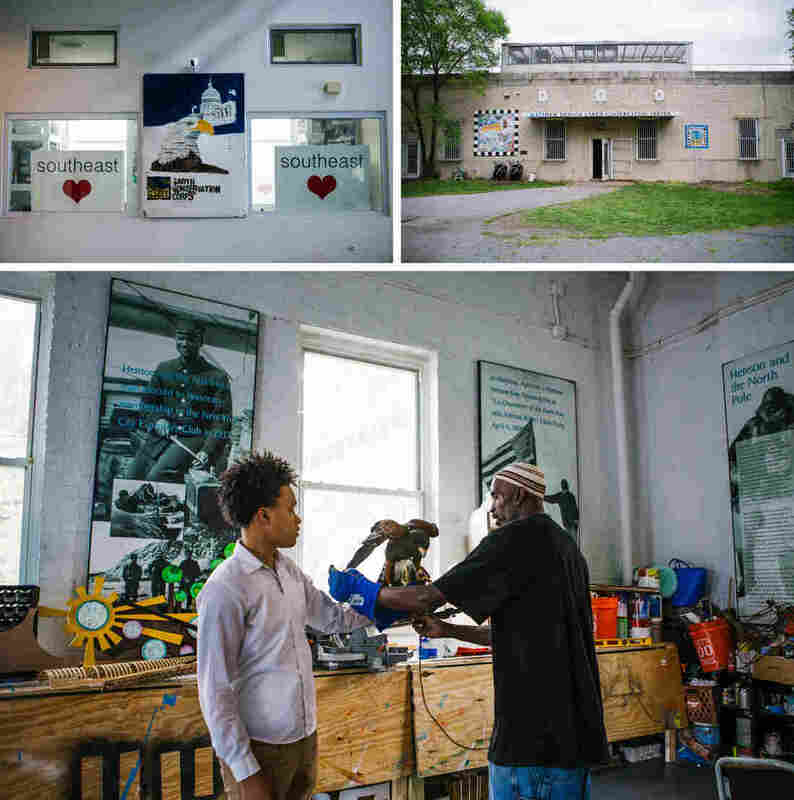 He's standing on a deck outside the Matthew Henson Earth Conservation Center, a facility on the Anacostia named for the first African-American explorer to reach the North Pole, which Henson co-discovered with Robert Peary. 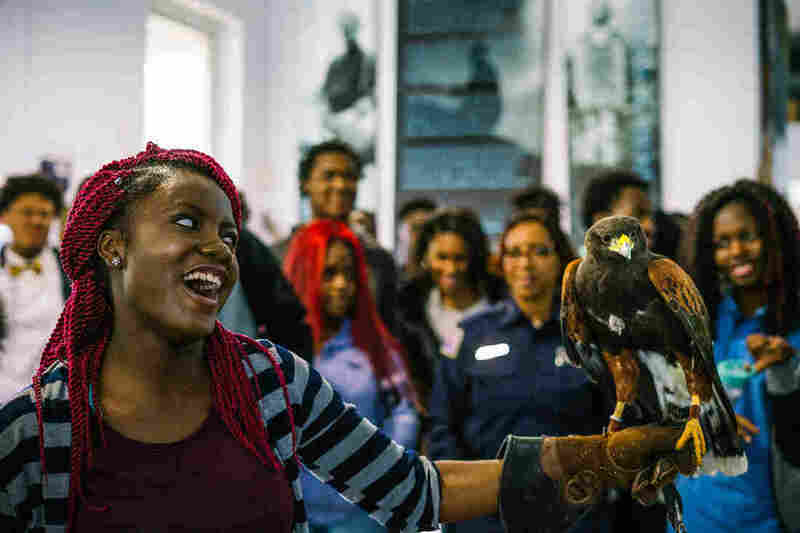 Inside, 30 inner city teenagers have just met a raptor for the first time – a red-tailed hawk named Sky, wearing bells, attached to a short line and handled by Rodney Stotts. "If you're afraid and you put this bird on your hand," Stotts tells the kids, "you've just done one of the biggest things you can, which is overcome your fear." There are gasps and screams, and some laughs, as giddy volunteers step forward to hold the bird on their arms. 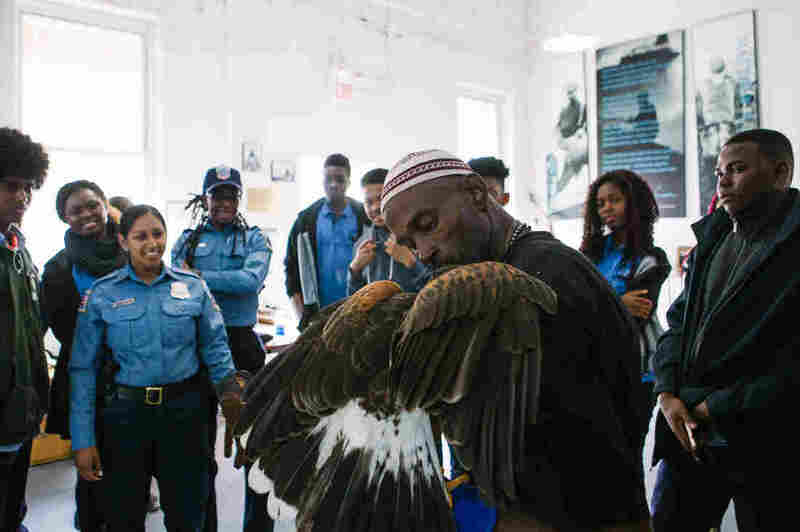 The former cocaine dealer who found his way to the Earth Conservation Corps more than two decades ago as a means of obtaining a check stub is now a licensed falconer – one of only 30 African-American falconers in the entire U.S., he tells the kids. "You're the only one that gets in your own way," he says. "Get out your own way, that's what I had to do." The kids are here as part of a D.C. police program called Youth Creating Change, which Thomas says encourages them to "face their fears, help them get a job, earn community service hours." Not only are they meeting Stotts and learning about his hawks today, they're also helping build the bones of a new osprey nest – welded out of decommissioned firearms seized by the D.C. police. "Rodney can connect with the kids," Thomas says. "He's been in poverty, he's been a part of all that. His story has an impact on the youth." Stotts — by his own admission "not much of a people person" — says educating the kids is gratifying. "You realize who you used to be and all you used to cause is pain and tears," he says, "and now you're causing laughter and joy." But he'd always rather be outside. 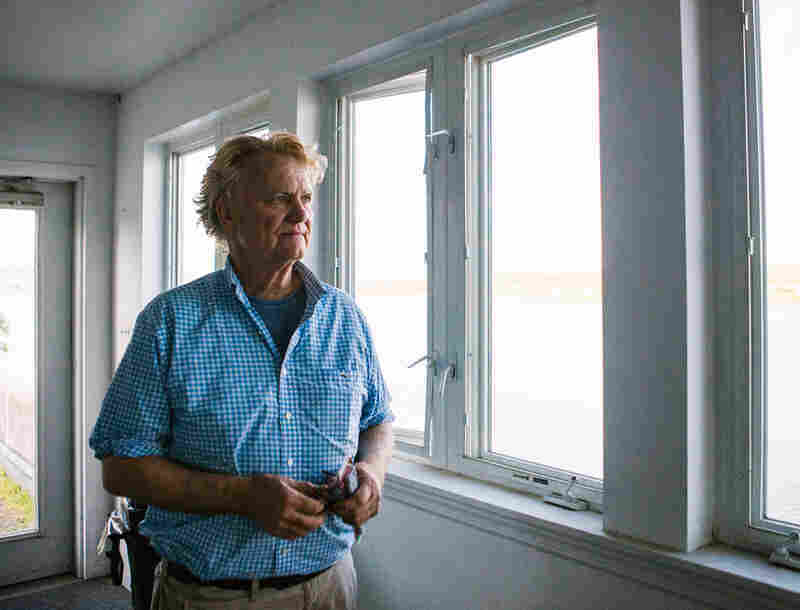 Working with the birds and other animals is what's saved his life, he says. "I'd have been dead," he says. "When I'm outside, I can go off and this great blue heron took off over my head and put my mind somewhere else. These fish swimming up the stream over here, the beaver with her babies going out now from stuff that, when you first got here, was just trash – all trash, you ain't seen no signs of life – so how can you sit here mad and want to fight, when all you see is beauty come back? That makes no sense to me. So I couldn't do an inside type of job. If I didn't get into animals, I'd have died in the street." Bob Nixon encouraged Stotts to become a falconer; he happens to be one himself. His own upbringing included a stint at a falconry center in England, where he learned as a teenager about birds of prey. But even with Nixon's support, Stotts' path to falconry wasn't obstacle-free. "I was told, 'Black people don't fly birds, y'all eat 'em,'" he recalls. " 'These are hawks, owls and falcons – not chickens.'" Stotts ignored the resistance and the racism – "OK, fine, no problem," he says now – and remained focused on what was important to him. "I always loved animals," he says. He's living in Maryland now, where he keeps horses, birds and other creatures, some of which he's named after loved ones who've died. And he's started his own program, though he keeps working with the Earth Conservation Corps. He's also poised to become a master falconer, and says he's expecting his license next year. "Now," says Nixon, "I'm Rodney's apprentice."